In 2014 Thames and Hudson published 'Anouska Hempel', a survey of the world-renowned designer's work. It was met with excellent reviews. I was honoured to work with Lady Weinberg on the cover design & photography and select project photography. The Napoleon Room at Cole Park provided a spectacular environment for the cover photograph. 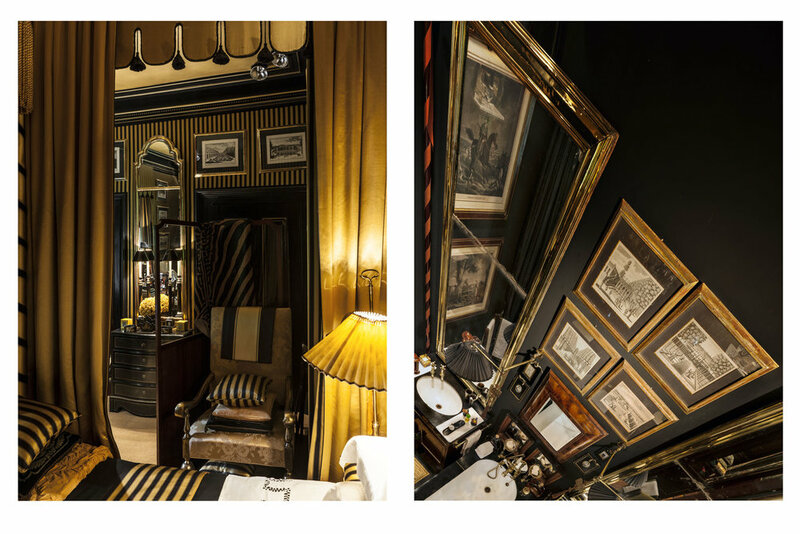 The design cues were taken from the room itself, in particular the three black lacquer chests of drawers which are inset with thousands of brass stars. The book was published by Thames and Hudson in 2014. It contains essays by Marcus Binney and the photographs of a number of photographers. I helped Lady Weinberg with the layout and to collate the numerous photographs used in the book. I also provided photographs for Cole Park. It was a remarkable and wonderful experience working with the designer and with the book publisher. Cole Park is a magnificent place. The architecture is remarkable. A secret road, leading through avenues of deciduous trees, arrives after some distance to a small bridge crossing a moat. Once crossed and through the gate the visitor is met by a beautiful neoclassical frontage, its windows glowing with soft light, surrounded by green foliage. Inside, the rooms are stunning and each unique. Outside, the garden matches the attention to detail and variety seen in the interior. I was delighted to photograph these spaces with an eye on bringing forth each area's unique style. Lady Weinberg has a astonishing eye for detail and it was fascinating to work with her on the book's production. I helped to communicate elements of the design and the requirements of production to Thames and Hudson. The photographs below display the remarkable nature of the rooms at Cole Park in 360 degree views. Do click on the arrows to the side of the images.